We have created this site to show you who we are, what we do, and what services we provide to our community. 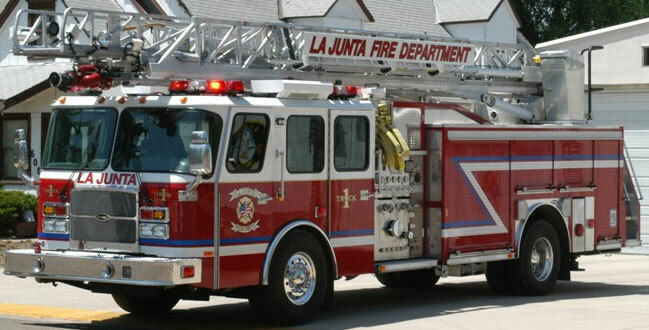 The La Junta Fire Department is part of the La Junta Rural Fire District. The Fire District encompasses the communities of La Junta, Cheraw and Swink. The Fire Department is comprised of Chief Joey Gacnik, Engineer Christian Weber, Engineer Michael Clark, Engineer Tracy Vasquez, Engineer Elijah Morgan, Part Time Engineer Matt Johnson, EMS Provider MariaIsabel Martinez, Part Time EMS Provider Francis Song They are supplemented by community volunteers from La Junta, Swink, and Cheraw. These volunteers make up the John Fisher Hose Company, one of the oldest chartered Volunteer Fire Organizations in Colorado. They were organized in 1883. Please take a minute and look through our website. We have tried to put a wide variety of topics and information on the site to answer any of your questions, or meet any of your needs. If you find something that doesn't work, or would like to see a topic explained further, please feel free to email me. PROTECT: from harm and further harm from the ravages of fire to the people, environment and property in the Fire District. To provide emergency care and transportation to sick and injured persons within the Fire District. To provide emergency response to acts of terror and hazardous materials emergencies and safeguard the safety of life, environment and property within the La Junta Rural Fire Protection District. EDUCATE: to reduce threats against life and property. DEVELOP: and train to increase knowledge and skill base. RESPECT: by being nice, kind, patient and compassionate. CONSERVE: and protect the sovereignty of the Fire District.